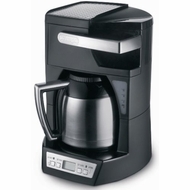 DeLonghi DCF210TTC Drip Coffee Maker has a 10-cup capacity, with complete frontal access to easily fill the water tank and coffee filter. Its double walled thermal carafe retains heat for hours. This coffee maker has an aroma button, which activates an unique brewing process that enhances the flavor and aroma of the coffee. It has a 24-hour programmable digital timer with brew automatic shut-off. Aroma Button: This special function option time-releases water to saturate coffee grounds a little at a time to extract a fuller flavor; the result is an enhanced taste and aroma for those who prefer a more full-bodied cup of coffee.